367 results. Displaying results 81 - 100. Tug of war medal won by K L Osbourne. 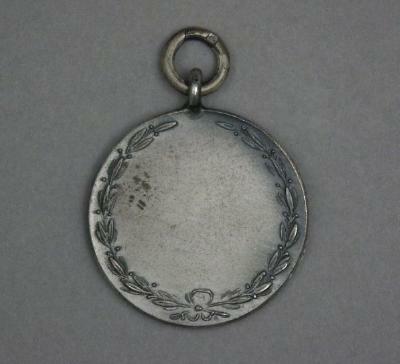 Small silver coloured medal with metal ring attached at the top. One side has a raised image of a man pulling on a rope. the other side is blank except for a wreath pattern around the edge. There are some letters stamped in the bottom edge. Royal Borough of Kingston Regatta medal 1949, presented to Keith L Osbourne. 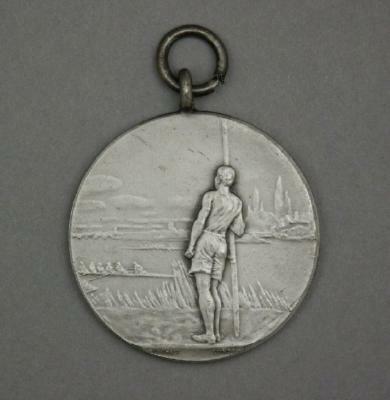 Silver medal with metal loop at the top. One side has a raised image of a oarsman stood on the riverbank holding an oar watching the two Eight crews on the river. On the reverse are the words 'Royal Borough of Kingston Regatta' around the edge and '1949' engraved in the centre at the top. 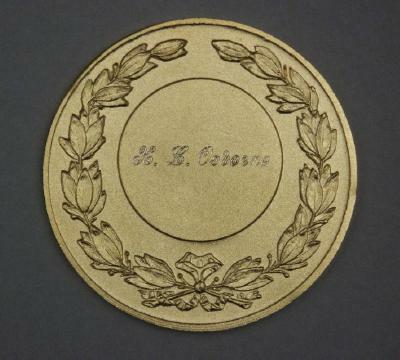 Amateur Rowing Association Centenary Medal 1882-1982 presented to Keith L Osbourne. Gold coloured medal, one side has the ARA initials in the centre surrounded by a wreath with crossed oars. Around the edge are the words 'Centenary 1882-1982'. 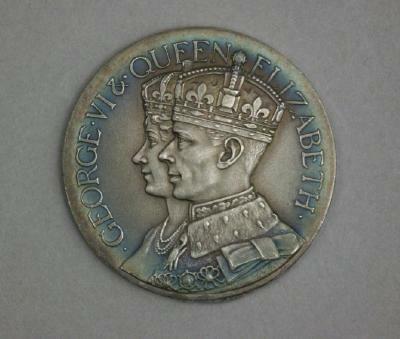 The reverse has a raised wreath pattern around the edge, and K L Osbourne engraved in the centre. 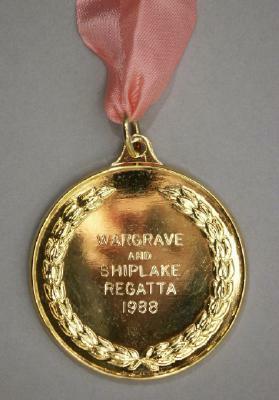 Medal and case for the Wargrave & Shiplake Regatta 1988 Greasy Pole event. The medal was never awarded because of sewage in the river. 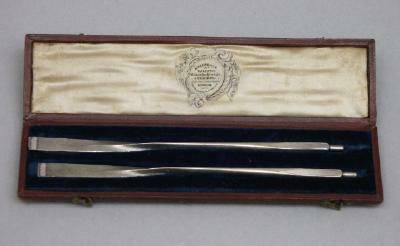 A pair of miniature silver oars in a leather case - a prize won by J Hall for Tonbridge Boat Club Challenge Sculls. Hallmarked as made in London in 1864. 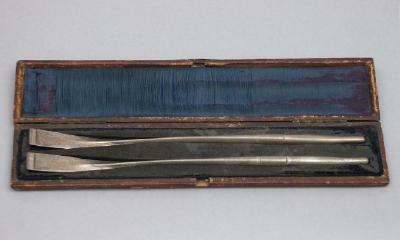 Pair of miniature silver oars in a leather case. Won by A Hutton, Richmond, August 19th 1848. Engraved on the plate on the lid. 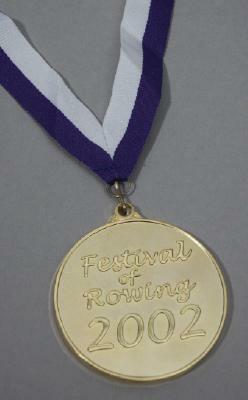 Gold medal from the Festival of Rowing held from Saturday 17th August to Saturday 24th August 2002 at Holme Pierrepont, Nottingham. 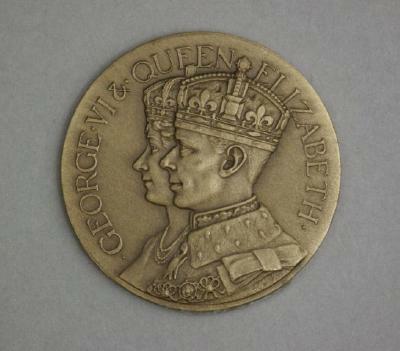 Henley on Thames commemorative medal in a case for the Silver Jubilee of King George V and Queen Mary in 1935.
Henley on Thames commemorative medal in a case for the Coronation of King George VI and Queen Elizabeth in 1937. 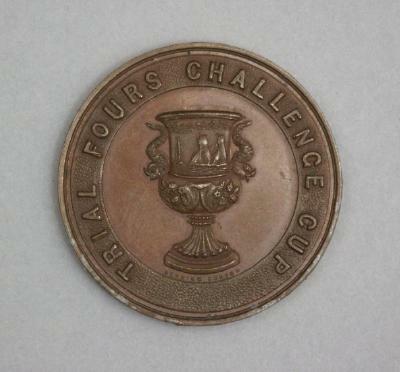 Bronze coloured medal with "Henley Rowing Club" on one side and "Trial Fours Challenge Cup" on the reverse. Tom barnard rowed for Henley Rowing Club at the Henley Royal Regatta in 1929 for Thames and in 1931 for Wyfold.